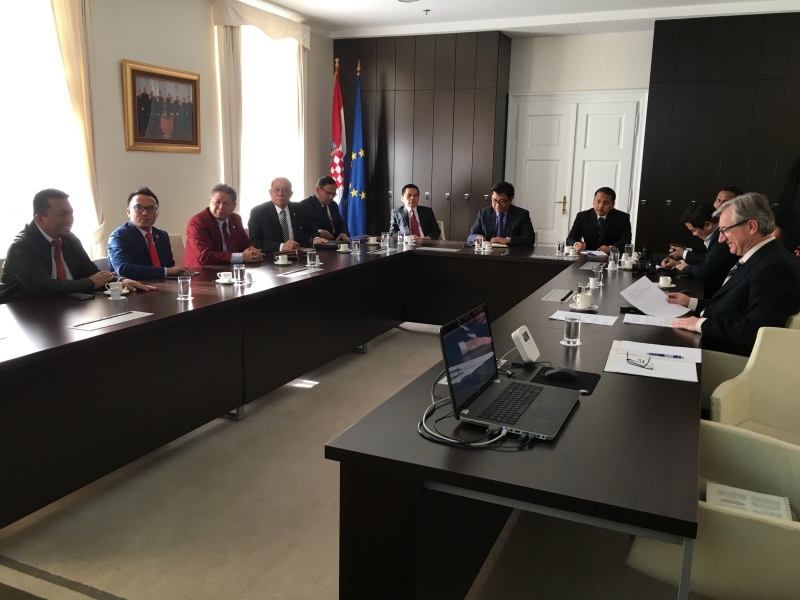 14 January 2019 - within their visit to Croatia, a nine-member delegation of the People's Consultative Assembly (Parliament) of the Republic of Indonesia from Jakarta visited today the Constitutional Court of Croatia. Dr Teodor Antić, Secretary General of the Court, received the delegation, headed by Dr Delis Julkarson Hehi, Mars, MP, and presented the organisation and operations of our Court, emphasising that, unlike the Constitutional Court of Indonesia, the Croatian Court is not part of the judicial branch of government. The Indonesian colleagues were particularly interested in the institute of impeachment, i.e. the competence of our Court to decide on the responsibility of the President of the Republic for the violation of the Croatian Constitution. They also talked about procedures for election of constitutional court judges, which is in Croatia completely different from that in Indonesia, where the nine Constitutional Court judges are nominated by: the President of the Republic (3), Parliament (3) and the Supreme Court (3), and they are confirmed in office by the President of the Republic.